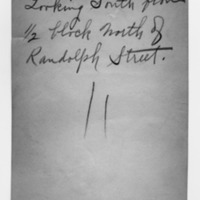 Edward H. Bennett labeled this photograph from 1913-1915 on the verso of the photographic print. The photograph is one of a series by planner Bennett in preparation for the design of Wacker Drive and redevelopment of the banks of the Chicago River north and west of the Chicago central business district. 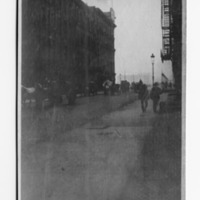 This photo shows the character of Michigan Avenue just north of the site of the future Grant Park. Bennett, Edward H. (Edward Herbert), 1874-1954, “Looking south from 1/2 block north of Randolph Street,” Digital Collections - Lake Forest College, accessed April 26, 2019, http://collections.lakeforest.edu/items/show/2034.